Envelope: Choose #10 (4 1⁄8 inches by 9½ inches) with a window or no window, European Sizes or a Custom Size. We even offer full bleed custom envelopes. Download a template and learn how to set up your file to be “print-ready”. 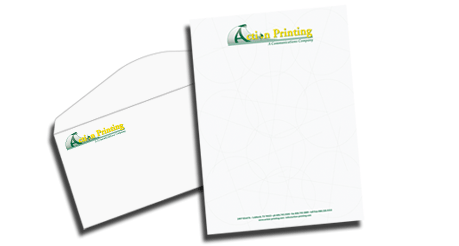 Custom letterhead and envelopes can be printed from your original artwork or designed by our in-house graphic design team. Choose your paper texture, color, and weight or let us recommend a suitable match for your business.